Indiana Governor Scott Holcomb in Clarksville on Thursday. LOUISVILLE, KY (WAVE) - Indiana is one of just five states without hate crime legislation. During a visit to Clark County Thursday, Gov. Eric Holcomb said he wants to change that. The Governor stopped by the One Southern Indiana chamber luncheon for a fireside chat, where he touched on several topics--including Indiana’s lack of hate crime legislation. 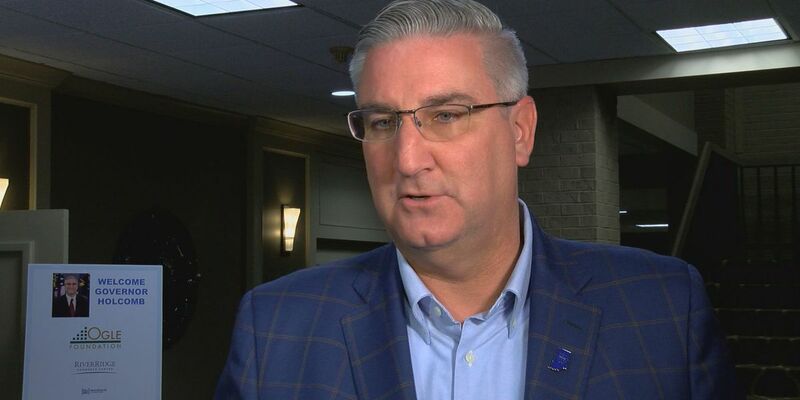 Holcomb wants to make passing a hate crimes law a priority in the 2019 legislative agenda. Hate crime laws typically hand down harsher punishments from courts if crimes are believed to be motivated by bias or hate. Holcomb publicly came out in support of a similar bill over the summer, after anti-Semitic graffiti was found at a Carmel synagogue. Indiana legislators have tried to enact a hate crime law for several years without success. In 2018, a GOP-sponsored bill in the Indiana legislature proposed longer sentences for crimes committed against victims for “bias motivated crimes”, which includes victims targeted due to race, religion or ethnicity. A similar bill was proposed by Democrats; both failed. In October 2017, a legislative committee failed to forward a recommendation on whether or not Indiana should create a statewide hate crime law, even though Gov. Holcomb supported it.